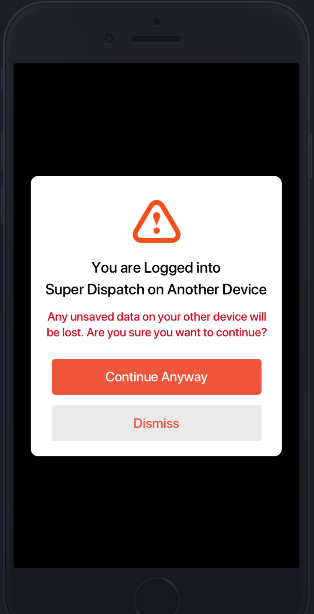 Super Dispatch will no longer support multiple drivers login to the same mobile account. We've stopped supporting multiple device login to improve data integrity. We've done this in response to customers who are experiencing sync errors and lost data when 2(+) people are logged in to a single app profile. Also, the sync errors are particularly concerning when users are using HoS feature, or the ELD product. To ensure we provide a solution to those of our customers who often have multiple devices logged-in at the same time, we've developed a bump protocol. This protocol will warn a user that someone else is logged-in, and will provide them the ability to bump the user that is currently active. How to Synchronize Unsaved Data with Super Dispatch? Log out from the app. You should leave only one device active. We used this method based on the feedback we received from you, the Super Dispatch community, and we hope that you continue give us your thoughts based on how you're using the product in the field.